EL SEGUNDO, Calif., March 22, 2011 -- Turkish Aerospace Industries, Inc. (TAI), a major international F-35 Lightning II supplier to Northrop Grumman Corporation (NYSE:NOC), has delivered its first production air inlet duct for the jet. 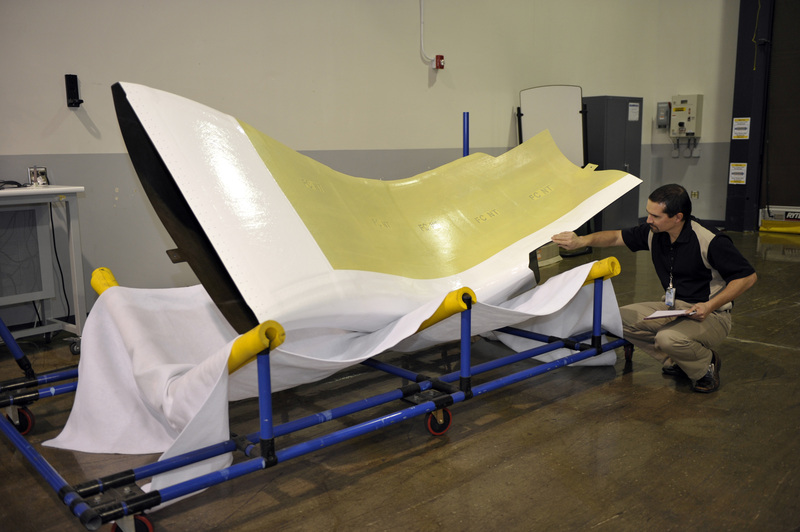 The delivery of the all-composite duct, a major structural element of the F-35's center fuselage, will support Northrop Grumman's production of F-35 center fuselages for conventional takeoff and landing variants at its aerospace production facility in Palmdale, Calif.
"This delivery reflects the growing maturity of TAI's composite fiber-placed manufacturing processes, and the steady evolution of its role as a second source supplier of center fuselages for the F-35 Joint Strike Fighter (JSF) program," said Mark Tucker, vice president and F-35 program manager for Northrop Grumman's Aerospace Systems sector. Northrop Grumman is a principal subcontractor of the Lockheed Martin (NYSE:LMT)-led F-35 industry team. TAI produced the air inlet duct at its composites manufacturing facility in Ankara, Turkey, as part of a five-year, $28.4 million contract awarded to the company in September 2009 by Northrop Grumman. "The delivery of this first production duct represents the successful culmination of a training process for TAI that began in El Segundo approximately two years ago," said David Dominguez, manufacturing engineering lead for international production for Northrop Grumman Aerospace Systems. "Over the course of that instruction, TAI's engineers and manufacturing specialists have grown from having limited knowledge of composites manufacturing processes to now being able to produce large, complex, high precision parts for one of the most advanced weapon systems in the world." According to Dominguez, the TAI training included rigorous classroom and hands-on work to teach its employees how to fabricate an F-35 inlet duct from start to finish. The training was conducted at Northrop Grumman's Advanced Composites Center in El Segundo. TAI is a second source supplier of F-35 air inlet ducts and center fuselages to Northrop Grumman. The company is slated to produce inlet ducts to support both the current production of center fuselages on Northrop Grumman's F-35 assembly line in Palmdale, Calif., and the 400 complete center fuselages that it will produce in Turkey. Deliveries of the TAI-produced center fuselages are scheduled to begin in 2013, as part the F-35 program's fifth phase of low rate initial production. Northrop Grumman is responsible for designing and producing the center fuselage for all three variants of the F-35. The company also designed and produces the aircraft's radar and other key avionics including electro-optical and communications subsystems; develops mission systems and mission-planning software; leads the team's development of pilot and maintenance training system courseware; and manages the team's use, support and maintenance of low-observable technologies.